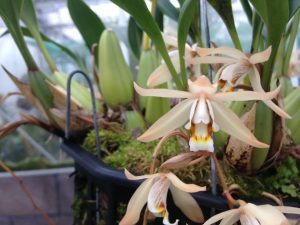 Coelogyne flaccida is another Coelogyne we have seen in our travels to Sikkim in the Himalayas. 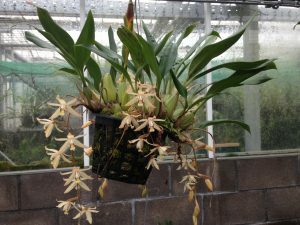 We have found it at around 1200m to 1500m altituse (lower than Coelogyne stricta) where we we have seen it growing as an epiphyte in trees and as a lithophyte on steep rocky roadside slopes. In both habitats it receives very wet summers but dryer cool winter periods. The flowers are intensely fragrant with a scent that reminds me of honey and the plant shown here is filling the Cool Asia section with its scent as I write. As you can see the flower spikes are very pendulous and so growing the plant in a basket works well so that it can be hung up when in flower. It is a good idea to water very little when in flower as the flowers are damaged by water and of course it flowers in the dry season in Sikkim when the flowers can last for several weeks in good condition.